After taking a bit of a hiatus, I am back and very excited to be. I spent this past weekend in Vermont with a good group of college friends that reminded me of why I love whisky so much and why I need to keep writing. 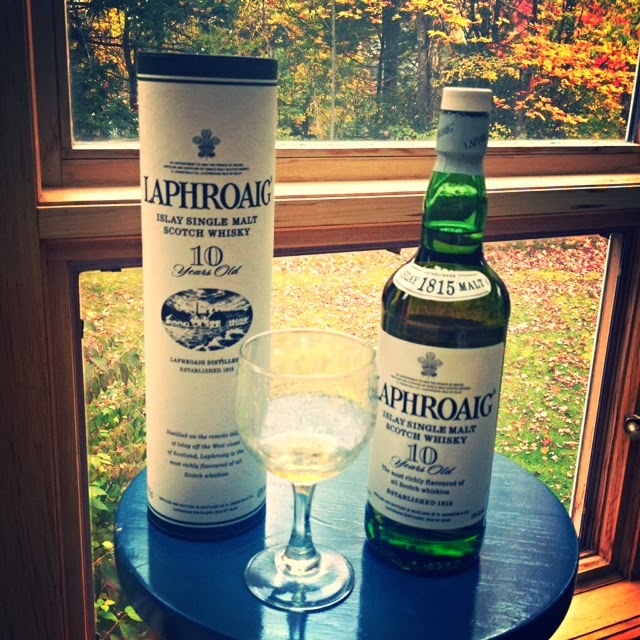 From what I tasted this past weekend I wanted to highlight Laphroaig 10. Looks a bit hard to pronounce, but according the Laphroaig website the pronunciation is Laphroaig (La-froyg). It has that signature Islay smokiness, so if you are not a fan of smoke then this will not be the whisky for you. For all my non whisky drinkers Laphroaig 10 is a great Scotch that is very affordable (price range $40-$55). Smell: The minute you smell this whisky you are immediately hit with the lots of smoke, seaweed and spice. To me this is perfect as I always enjoy a good smoky Scotch. Taste: The smoky smell then transcends into the taste as you get hit with that smoky taste. I got hints of saltiness with a slight burn. At times I got a peppery taste as well and you can make out the peaty notes. In my opinion, it is a very enjoyable Scotch. It’s also a good Scotch for that cold/chilly weather that will soon be coming during the fall/winter months. It was perfect this past weekend as there was a nice chill in the air up in Vermont. It was on our way back to Boston from this trip that I was reminded why I started writing this blog. We stopped by the NH Liquor outlet and I might have spent about 30 minutes just staring at all the single malts, bourbons and Irish whiskey selections. While there one thing I noticed was that most of the people grabbing products weren’t entirely sure what they were buying. At one point I heard, “this bottle looks cool, I’ll just get this.” Trust me there is nothing wrong with picking up a bottle because it looks cool, however a cool looking bottle doesn’t always mean you will get a great tasting product. As the saying goes, don’t judge a book by its covers. 1. The first time you try it, chances are that you will not like it the 1st time… the 2nd, 3rd or 4th time, etc. ; in my opinion it really is an acquired taste, and something you eventually build a great appreciation for. 2. It is OK to have it in a cocktail, with water and even ice. I know I make a big deal about me being a neat (straight up with no ice or mixers) drinker, but that is not how I got my start. You better believe that my first Bourbon was packed with ice. 3. Not all great tastings whiskies or bourbons are expensive. You can go out there and find a great tasting product at an affordable price, Laphroaig 10 is a good example. There are whiskies and bourbons for all price points. 4. What you taste may not be what someone else tastes. Everyone’s palate is different. If you and I sat down to share the very same dram, chances are I will taste notes you don’t and vice versa. This means that there might be a product you hate but others might love and that is certainly ok. Finally, start with something light that will eventually help you acquire a liking for it.